David Gardyne Stuart Lindsay was born on 3rd October 1889 at Adelaide, South Australia. From 1907 he worked in the South Australian branch of the Bank of New South Wales as a bank clerk until he enlisted in the First Australian Light Horse on the 10th August 1914 . David Lindsay wrote a Diary of his experiences during 1914 and 1915. The Diary started when he boarded the Transport, "Star of Victoria", in Sydney Harbour, as part of the first convoy to Egypt. He then described his training in Egypt and his service in Gallipoli, as a corporal, between May and September 1915. Following illness he was evacuated from Gallipoli and was hospitalised in Egypt. The diary ends when he had recovered from his illness and was considered fit to return to his unit. Subsequently he saw action with the 1st Australian Light Horse against the Senussi, after the Australian Light Horse had returned from Gallipoli to Egypt . He then transferred to the Artillery, where he was commissioned, and saw action on the Western Front at the Battle of Polygon Wood in 1917. Here he was wounded in his left wrist and was hospitalised, first in France and then at the No 3 London General Hospital in Wandsworth, London. He returned to Australia in February 1918 and resumed his banking career after demobilisation. The Diary and Papers were left to Dr Errol Tompkins of Sydney by David Lindsay's daughter, Jane. The photo and Diary are reproduced here by permission. Very wet. Great fuss at camp and rode into wharf. Also said goodbye to Don who was at the gate. Saw Mother, Non, Dad, Leo and Don on wharf as we steamed out and managed to say a few words. Moored up just off Cremorne. Saw Mrs Shand on Ferry Boat. Great fun getting into hammocks etc. Left buoy at 6.15 AM. Saw some people at Cremorne Point. Were they my family? Big swell on and nearly everyone sick. I felt a bit off at times but had every meal and slept very well at night. Woke up fresh, very smooth sea and all up and well again. Passed Wilson's Prom[ontory] at about 3.30 PM. Great wondering as to whether we were going into Melbourne or not. Another fine day. Did not touch at Melbourne in the night. Not feeling too good today. Slight swell on so perhaps am a little sea sick. Nothing eventful happened. Had a good night's rest. Beautiful day. Wonderfully calm. Nothing startling happened. Should anything happen to me I want non to have this diary but have addressed it too Art as I know his address. Another calm day. Nothing doing. I (illegible) some awful tales to the fellows here. I asked one chap what the ship's log is and he says it's the big log they hang over the stern by a rope to indicate the pace the ship travels. Nothing doing all day. Church service at 10.15 AM and slept all the rest of the day. The mail bag is up but we don't know whether we will call at Albany or Fremantle. Anchored at Albany at 8.30 Am. Very cold and wet most of the day. Not at all impressed with the beauty of the place though the 20 odd troopships look very fine. Have felt very off colour the last couple of days with a very sore throat and at times a rotten cough. Posted letters here to Mother, Jean and Don and will send a wire if possible to Mum at Adelaide. Last night one fellow in great excitement said that the ship had stopped. When we said it was still going he said 'Look at that big star up there it is not moving'. One would hardly credit the ignorance that is met with and it is to be hoped that England doesn't judge Australia by some of our men. Very wet cold morning but fine afternoon. Sent wire to Mum. Nothing startling. All letters to be censored now. Had a letter from Jean. N[ew] Z[ealand] fleet arrives 9.30 AM. 2nd horse thrown over. Nothing doing. Moved right into harbour. Took on stores. Started to leave Albany at about 7 AM. A very fine sight indeed. Showery. 4th horse overboard. Rather rough today. Things settled everywhere in night. Very quiet. 5 horse dead. Ditto. Hot. [SS]Osterley passed us at 6.30 PM. Saw dad, Non & Leo but not mother. Non seems to be having a good time with a couple of the officers. I'd like to go and have dinner with them or finish the trip to England on the Osterley. Pretty hot now. Sports in the afternoon. I got in the shade and had a good read and sleep. 9th horse died. A fellow died on [HMAT] Euripidies (sic). She pulled right out of the line to bury him. I was rather worried as I thought it might be Jerry but later on heard it was a man named Kendall. One scalp for the Germans for which they shall have to pay. It is now reported that 2 fellows died on the Euripidies (sic) yesterday and that they have enteric fever aboard. We also heard that a man fell overboard on the boat behind us last night and was lost. Getting very warm now especially on the troop deck where we are supposed to sleep and have to eat. The perspiration runs into the tucker it is so hot. I sleep up on deck but generally get hunted down by the rain during the night. The boards are rather hard to sleep on. Crossed the line about 8 PM. Very hot again. Eleventh horse chucked over yesterday. Very hot again. Prickly heat prevalent. Father Neptune celebrated today. Great duckings in the bath but escaped. Had to rise early as the Sydney was expected to pass us around 5 AM. Got up about 4.30 but found she had gone so there was no Reveille. Land in sight shortly after daybreak. At 2 pm we dropped anchor at Colombo. It appears to be a very beautiful place especially on the way to the Galle Face. I remembered so much about the place from Non's descriptions so that it was quite safe for me to hold forth and told the fellows all about the place. They all think I have been here before. It was a nice cool morning but hot in the afternoon and night. Wrote letters to Mum Art Don Curtis & Lennon. Our mail is aboard & hope to receive a letter today (16). Still very hot and still here. No mail delivered yet so don't know whether there is a letter for me or not. Hope to goodness we don't stay here long. It's very beautiful but not much good to us cooped up on board. A month today since we sailed from Sydney. Pretty warm. Blacks diving. A number of boats left this morning. We weighed anchor at 7 p.m. There are only seven or eight boats with us. Sighted the other fleet at about 6 a.m. Very hot. 5:45 a.m. Reveille. 6.15 fall in and feed horses. Finish that in about one quarter of an hour and then off until breakfast at 7:30 a.m. Parade again at nine and exercise horses until about 12. Then off. Dinner 12.30 and parade again at two. Finish that at 4.15 - Tea at 5.30. The official message sent through by wireless, re the Emden was as follows - Sydney started for Cocos Islands at 7 a.m. and at 930 had sighted the Emden traveling at full speed. The Sydney got within range in 20 minutes at the same time signaling the chase was North. At 10:45 a.m., the Emden beached herself to avoid sinking. Her wireless and three funnels were shot down but the flag was still flying. Sydney then went after the Emden's collier, took the crew off and sank her. Sydney returned again to Emden who surrendered. The extent and nature of the German casualties are not yet known, but are bound to be severe. Sydney's own casualties require hospital treatment which was probably found on Direction Island. The Emden had time to destroy wireless telegraph station and cut one of the three cables. A second cable is intact and probably the third. All the instruments except one were destroyed. This had been buried and now in use again. The wireless and cable operations deserve much praise for sticking to their posts, sending out messages and saving instruments. The Sydney will sail for Columbo as soon as she gets the German prisoners and wounded on board. The operation may take 24 hours as it presents considerable difficulty. I should have written this before but had been too lazy to take a copy. The mail is to be free from censorship now. Steamed into Aden on account of the collision between two of the boats. Very hot. Left Aden 7 a.m., Ditto. Roseberry all over again. Still, I intend to make the best of it and have a good time. Hope we get a smack at the Turks. Cooler today. Nice breeze. Got saddles up and cleaned them. My school day. Busy. Get kits etc together. Very cold night. Fairly cool. All out in uniform. At Suez at about 10 a.m. All sorts of rumours regarding the Turks. We may be at them in a few days. Cold night. 15 Indian troop ships arrived at Suez this morning. Escorted by a French cruiser. Into the canal at 2 p.m. The banks are all guarded by the Indians and Territorial and had a great reception, as we went along. Anchored at Port Said at about 5:30 a.m. French cruiser passed us and cheered us wildly, Art';s birthday. Left again at 8 p.m. People are singing and cheering on the shore. Arrived at Alexandra and anchored in the harbour at about 10 a.m. Remain there all day. Slightly showery and quite cool. Nothing doing. Still on board. Still on board, but think we will get off tomorrow. My horse, Tommy, is very crook this evening. I have had the Vet and got him dosed so am hoping he will be all right. Wrote mother. A number of men took French leave last night and got ashore in boats. There was a great row about it. We are still a way out. All Non Coms had leave in the evening until 1 a.m.. We got ashore in boats and then got a cab up to the decent part of the town. I managed to get a good guide. We first of all had a jolly good feed of steak and eggs and then told the guides to show us everything worth seeing. We had a drive around and it was really an eye opener the way things are carried out. I will be able to tell you everything after it's all over. Berthed at the wharf. One Squadron disembarked. Very wet cold afternoon. Had the evening off and had a good time. Disembarked and got away at about 11:30 a.m.. Had a most interesting trip. umerous mud villages with streets about 2 yards wide. Reached Cairo at 5:30 p.m. Cocoa and Rolls served out. Got a move on at about 630 and had a long walk (about 10 miles) to Maadi. Reached there at about 10 p.m. Most of us very tired. No tents. Rained in the night, but I was well covered up in my blankets and overcoat. Got my sleeping bag out, so we'll be all right for tonight. Busy in camp all day. Maadi is a very pretty place on the Nile. The Pyramids are about 10 miles away. In the evening I went over to the S A [South Australia] camp and saw a couple of my old pals. Leading horses around all day. Had leave in the evening and went to Cairo, which is a beautiful city. Another fine day. We get it very cold here at night. Went over in the evening and had a yarn to a couple of the S.A. officers. Writing to mother to try and catch the English mail. Church parade. Nothing doing in the afternoon. Went for a stroll around Maadi in the evening. Very pretty place. Wrote Jean. Nothing doing. Exams in the day. Spend the evening in Cairo. Ditto. Exams finished. In my opinion they were a mere farce. It was supposed to be for the Non Coms but I think everything was cut and dried before they took place. We have not yet been told the results so don't know whether I have been promoted or not. Sent cable to dad. Very hot. Horses being ridden a little during the afternoon. Received cable from dad. Was told my Squadron leader strongly recommended me for commission, but Meredith would not give it. Went into Cairo in the evening. Had a procession through Cairo today. Very interesting trip. Rather hot on the way home. Reveille at 5:15 a.m. Left Maadi at 7:15 a.m. We got back again at 1:30 p.m. Went to Cairo in the evening. Went to church at 9:30 a.m. and took communion. Nothing like Xmas day but not as bad as the one I spent at Jamestown. Was on duty all day so could not leave. Had a hot shower at the (? )gaol at Maadi. Got the afternoon off, went out to the pyramids. Saw numerous tombs and a ruined temple. A very interesting trip. In the evening knocked around Cairo. Nothing doing. Got letters and papers from London. Left Maadi, 8:30 a.m. got a guide at Cairo. Went through a mosque built by Sultan Hassan from the base of the big pyramid, is 560 years old. Dome 250 feet. Walls 8 yards thick. Went to the blue tiled mosque. Put on big yellow slippers over my boots and had a look at the tombs etc. Went through the gold and silver bazaars. Bought a couple of things. Most interesting shops. Wish I were a tourist. Went through museum and saw many mummies and very many interesting things. Dismissed guide at 12.30 as I had to go to the hospital to see a pal who was injured in the procession by a horse falling on him. Spent the afternoon at the hospital, which is the Khedive's old palace and is now a most beautiful place. The walls are all painted and took a man 30 years to complete. When he had finished, they put his eyes out so that he would not be able to paint anything like it. New Year's Day. March past George Reid and then he addressed us telling us he had Kitchener's promise to send us to the front as soon as we were fit. Nothing doing all day. Got a leave in the evening and went to an Old Scholars dinner held at Shepherd's Hotel, Cairo. Had a good time. Received letters from London. Our new officer took charge today. He was a private and had no experience whatever. Bitterly cold and terribly dusty. Got afternoon off and went to Mena where the infantry are encamped and spent up to 7 p.m. with Jerry, then back to Cairo and home. The infantry camp is one of the finest camps I ever had the good fortune to see. Ditto. Went to Cairo in the evening and had a splendid hot bath, which is one of the best things obtainable in this city. Pease pudding and cake arrived. Nothing doing received eight letters today. Wrote mum. Nothing doing. Receive nine letters today. By Jove letters are very welcome though answering them is a dammed nuisance. Missed writing this up for over a week. However, there has been nothing doing. Went into Cairo two or three times and had a hot bath every time. Went to a concert in S. A. Regiment which was good. I wrote Bridges and Weir. Had reply from Weir saying he would be glad to see me. Nothing much doing until today when we had to shift camp from Maadi 8 miles south of Cairo to Heliopolis 8 miles north of Cairo. We left our old camp at 9:30 a.m. and rode across the desert. We struck the dead city, which is where a great many people used to live but cholera broke out and they cleared away leaving their dead unburied. No one has lived there since that time. First of all we came to a very large cemetery. The graves are nearly all alike with a slab of stone along the top at each end. Then we came to places all walled in evidently old living places, but of course mostly now in ruins. Occasionally we could see in through a broken door or window, and there was generally a few graves inside. It was terribly dusty and riding through at times we couldn't see 5 yards in front of us and the stink was pretty crook. We had to pass through a good deal of old Cairo and it was rather interesting. Heliopolis is a part of suburbs of Cairo and has been built in the last five or six years. The buildings are really magnificent and nearly all white. The streets are wide and well laid out. We passed two or three funerals. The native funeral is rather a peculiar affair. Two or three of them carry the dead person in a kind of open box with a cloth covering the top. They are usually accompanied by about 20 or 30 other natives, Some of whom occasionally ride double. They evidently have no foundation for the procession but walk everywhere and at times start singing. I can't describe their singing. One funeral, we saw yesterday was evidently that of a baby. We heard the singing of some half dozen men before they came in sight, and then we saw a man riding a donkey with a small coffin balanced on the donkey in front of him and covered with what appeared to be a shawl. This is a terribly dirty, dusty place where we are now camped and much hotter than Maadi. The country is much flatter and the sand is merely a fine brown dust. It will be impossible to keep clean. We arrived here at 2 p.m., and of course had to fix things up a bit. After tea and a couple of us went for a walk up the town. It is really pretty and I must go up in the daylight if possible. Sunday. No parade, so slept all day pretty well. Nothing doing. The second contingent of infantry arrived here today. Got day off to go to dentist. Went to Pyramids to see Colonel Weir but he was not to be found. Went back to town and met Jerry. Spend the evening with him. Sunday and nothing doing. Went to Cairo in evening and spent the time at a picture show. Drill all day. Went out again drilling at about 3 p.m. and did not get into camp again until 2 a.m. We were digging trenches. Reveille, 5 a.m. Another all-day outing. All the Light Horse were out. We were amongst the cultivated ground. It is really beautiful. The green crops of Lucerne or wild groves of palm trees here and there and the natives working in the fields. We went through several native villages and got back to camp at about 7 p.m.
Drilling all day. Dentist at night. Reveille 5:30 a.m. and then went out to a big review of the troops. There must have been 7 or 8000 of us. Infantry, Light Horse and artillery attacking a position. It was a night well worth seeing, but the artillery makes one realise that war is not the best of games. I had to take charge of some fellows, and then went on and go to another camp for some stuff and did not get back until 7:30 p.m.. So had another long day. Saturday and not much doing. Just got in parade at about 10:30 a.m. when they told me I had to go to Maadi and get two men who are being discharged from hospital. Got back to camp about 4:30 p.m., and then got leave and went back to Cairo to the dentist. Church parade. In afternoon went to Mena and saw Colonel Weir. Spend evening with some people named Shore. Got afternoon off and went out to Maadi to see Hector Shelley Spent the afternoon with him and went into Cairo for the evening. Nothing doing. Had to work to mules to Zeidoum. In evening a lecture on present war. Very hot. Digging trenches all day and went out to Heliopolis for a hot bath and feed in the evening. Still very hot and digging trenches all day. Rather a good day's until today, but too hot to be pleasant. Went into Cairo in the evening with a couple of pals and had a good time. Reveille 5 a.m. and out all day fighting the New Zealanders. We had a very good day indeed and as we were amongst the crops all day it was not so hot. Received letters and papers from London. Struck tents in morning for an airing and read papers in the afternoon. Very hot and beastly dusty. Very dusty and hot. Lay in bed reading all day. De Saxe came in to see me at about teatime, we went up to Heliopolis and to Luna Park. Knocked around generally and had a good time. Beautiful day and an easy one as far as drill was concerned. I slept in a trench for a couple of hours, trench 3'6" deep and 18 inches wide, so didn't have much room. Drill all day. Went into Cairo to Shores in the evening and had a pleasant time. Went into Heliopolis for a bath and needless to say enjoyed it immensely. Afterwards went to Luna Park. At rifle range all day. Got back to camp at about 3:30 p.m. At camp again at 9 p.m. and rode out about 8 miles. No talking or smoking allowed. Dug trenches all night and got back to camp at 8 a.m. on Saturday. Very cold time. Church parade in morning. Went to Cairo and spent afternoon at Shores who took me to a picture show in the evening. Had my fortune told. I am to have a slight accident at the war, but it won't be serious. I'll marry a girl with dark hair and have two kiddies. [David Lindsay only had one child, Jane!] After three or four years I will have much happiness and pleasure. When I get back to Australia some big building is going to make me very happy. At rifle range today, very hot and dusty. Rifle ranges again today very hot and terribly dusty. When we get back to camp, everything was in an awful mess and I had to get every thing out of my tent and shaken. I can now understand why mother used to worry when the house was dusty. Very hot and frightfully dusty all day and quite a warm night. Not so hot but drilling all day and so pretty dusty. Went to Cairo in the evening. Took one of our blankets today. No parade expected to be leaving next week. Sunday Church parade in the morning. No one wanted leave in the afternoon, so I got it. Went into Cairo with a pal and went through the native bazaars. Then through a couple of mosques, after which we went up to the citadel and into the mosque there. It is really beautiful and has thick carpets, and hundreds of hanging lamps. I believe it is supposed to be one of the finest mosques in the world. We saw a lot of Indian soldiers who were wounded at Ismailia. We then went back to the city, had a snack and wandered about a good while. At about 8:45 p.m. took a cab and drove round a bit. It was now moonlight and the Nile look beautiful. 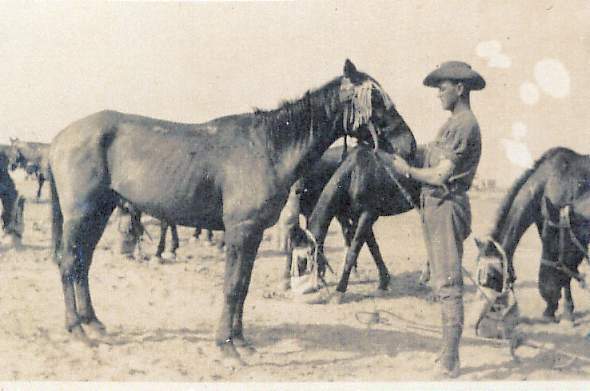 Got back to camp at about 10:45 p.m.
Reveille 15 a.m. Fed horses. Had a bit of breakfast and left camp at 4:15 a.m. Rode out about 12 miles and fed the horses again. Then had a sham fight. Back to the camp, where we arrived at about noon. Nothing doing in the afternoon except we got horses clipped. The Niggers were clipping them. I told them mine was an officers horse so they took especial care of him. Rained a bit during the evening. Beautiful fresh morning. Nothing doing practically all day. Had a couple of heavy showers of rain in the morning. Spend the evening at Shores. Kit inspection and nothing else all day. Out in the desert from 9:30 a.m. until 1:15 p.m. and then finished for the day. Big march past. General, McMahon and all the other heads. Thousands of troops and the heads were very well pleased with us. Nothing doing in the afternoon. Reveille 5.30 a.m. left Heliopolis for Maadi. Had to fight our way into camp there. Got there at about 5 p.m., and after fixing things up went across to see Shelly. Had to sleep on the sand in front of our horses. 24 March. Maadi for Helouan which we reached at about 2:30 p.m.. Had a walk round the town in the evening. It is a rather nice place with very fine pubs. Helouan is a great health resort and is noted for its sulphur baths. I only had half a piastre [a penny farthing] and so had to look in the windows of the restaurants. So could not help smiling when I realised how poor I was. Left Helouan again, and marched back to Maadi. Spent the evening with Shelley and went to a concert in the camp with him. Left Maadi for Heliopolis. Fought the New Zealanders on the way. Pay was dealt out at about 5:30 p.m. and I went up the town for a hot bath and a feed. Nothing doing today. Or on guard tonight, and so have spent the morning cleaning up my gear. Sunday and a terribly rotten dusty day too. On duty all day, but went into Cairo to picture show in the evening. A big review for the benefit of Ian Hamilton place today. Thousands of troops and all looked very fine indeed. Pretty hot. Hot and out about 10 miles and digging trenches in the desert all day. Not the best of work, but better than banking. Parade as usual. Went into the Shores in the evening. Good Friday. Left camp at about 8:30 a.m. and rode about 25 miles out to a place called the Delta Barrage which is the first dam or weir of the Nile. We had to ride through Cairo and along the main road to Alexandria. As there was a great deal of cultivation land on each side of us it was not a bad trip. When we got there at about 4 p.m. we fixed up horses and then waited around for tea. The plain where we were camped is a beautiful botanical Gardens with glorious green lawns. We were told we could sleep where we liked so you bet I was camped on one of the lawns. Had a great sleep all night and thought I was Adam when I woke up in the morning on a lawn with trees all round. After breakfast we took our horses and swam them across a bit of a canal by means of ropes. This took us until nearly dinner time and we were then free till 5 p.m. There are rails around the gardens and niggers push you around on small trucks. I went around the gardens on one and then got a donkey and rode around the place. The gardens are beautiful and I wish we could stay there for a week. Several of us had a bit of a row on the Nile for awhile. After feeding up the horses one of the fellows said he would shout me my tea at a pub so we went into the village. There was a kind of a circus over there which began at 9 p.m. and ended up at 3 a.m. We went out for a couple of hours and then went to camp. Reveille 5 a.m. Had a bit of breakfast and then left for home again. As it was the same road we had come by it was not interesting. Got into camp about dinnertime and a sleep in the afternoon. A dust storm started at about 10 p.m. and raged all night. Dust terrible and impossible to have any parade. Good days parade. Nothing much doing. Another good days parade in the cultivation parts and so very little dust. Nice day but on guard all day. Writing in the evening. Tom Fitch and I went into the Shores for the evening and had a very pleasant time. Nothing doing. Webb from Saints has come into this regiment as a doctor, he is a captain. 18 April. Got leave in the afternoon to get away from camp for a few hours. Just wandered about in town and nothing in particular. Off parade as had to go to dentist. An inspection of brigade today. Left camp today and rode to Cairo to Maadi which we reached at about 2:30 p.m. Saw Shelley. In the evening went down the town for a feed and then went to a boxing match between a couple of the soldiers. Left Maadi for Helowan. In the evening wandered about the town. Our regiment crossed the Nile in punts, and then rode about 7 miles out to the Pyramids of Sakhara. We visited the tombs of the 24 sacred bulls. It is a big underground place and a wonderful bit of work. We saw other tombs and the statue of Rameses II, which is a very large figure of a man lying on its back and broken off at the knees. We got back to camp about 7:30 p.m. and went up to town for a feed. Very hot. A pal and I went into Cairo and knocked about in the afternoon and evening. Very hot. A church service was held in the church and I very much enjoyed the old service. In the afternoon I had a sleep in the garden of one of the hotels. Still, hot. Left camp at about 7 p.m. and got into Maadi at midnight. Had a good sleep. Left Maadi at about 9:30 a.m. and rode through Cairo to Heliopolis. In the evening went and had a hot bath, for which I was sadly in need. Had a ride about 4 miles across the desert to the cultivated part so that the horses would have shade. On guard tonight. Still very hot. On guard all day. Took us jumping over some stonewalls this morning. Good fun. Great reports of the landing of the Australians at the Dardanelles. They did great work. It makes us all feel rotten being left here and all our mates doing the hard work and making history. Why can't we go too? Nothing doing. Went into Shores in the evening. Great rumours of large casualties in the Dardanelles. Hundreds of wounded are being brought here. Nothing doing. Went to a fete in aid of the Belgian wounded in the evening in Cairo. It was held in a garden in Opera Square which was beautifully decorated. Nothing doing. Stayed in camp in the evening. In the evening went over to see Col. Miell & Bleechmore but couldn't find them. Wrote to them both on returning here. Heard Algy only got as far as Melbourne & then went back to Adelaide. Turned into infantry & went for a three or four mile march In the afternoon took a lot of the horses back to the depot. There are 6 or 7000 horses there. Busy packing up saddles etc as we are going away without our horses. They say we will get them again some day but I have my doubts. We think we are going up to the Dardanelles to reinforce the infantry but of course we don't know for sure. Busy packing up saddles etc. as we have to store them here. Took a flying visit into Cairo to say goodbye to the Shores. Wrote home twice. Nothing much doing. I wrote Col Miell & Clive Bleechmore on Tuesday night. This afternoon C B came to see me. He said Col. M is in a state because he thought your letter was from Algy and wrote a very cool reply. He is at the road now so you had better come over and see him. Of course I went and the Col was as nice as possible and said he would always do what lay in his power for me and apologised for his cold letter (which I have not yet received). He said he could not rest until he saw me and explained things so rode over. We have been packing up all day and a camel isn't in it with us. We have to carry everything of course and have even to take some firewood in our knapsacks as there is no wood where we are going. We expect to reinforce the infantry and will have some hard fighting. Hope I get through alright. We fell in at 8 pm and were issued with 150 rounds of ammunition and were then dismissed. We fell in again at 11.30 pm and the Col said a few words to us as he has been left behind. Then we had a march to Zitoun a distance of from 4 to 5 miles where we entrained for Alexandria. Had a pretty good sleep. Reached Alexandria at 10 am. They took our leggings and issued us with puttees. Managed to get a cup of tea and sandwich at Y.W.C.A. store. The Queenslanders are on board with us. Our boat is the Dirranha and is a good big one though pretty dirty. We weighed anchor at 7.30 pm. Had a good sleep. A perfect day, calm and a nice breeze. We have been told that if one of our mates gets wounded to shoot him rather than let him fall into the hands of the Turks as they are mutilating prisoners in terrible ways. Rather cheerful eh! Our men are a happy lot and I am sorry for them. I don't think I'll funk and hope to goodness I'll fight as I should. Have been made a Corporal in place of a man who was too ill to come away. At 5 am we heard the guns and soon after came to Kum Kale. The battle ships were firing. We went up further and anchored for the night. The sound of the guns and rifles was awful. First thing in the morning we disembarked. We were supposed to land under fire of a concealed gun but fortunately it did not fire. It is marvellous that out boys ever took the place. There is a small beach then steep hills and valleys. Shells etc were bursting over our heads into the sea. About 3 pm we moved up close behind the firing line. Had to sleep in dugouts or in whatever shelter we could. 4 am we had to stand to arms in case of need but there was nothing doing. I had a fairly good sleep during the night but the row was terrible. We expect to go into the trenches any minute now. Only hope I come through. The snipers are deadly as they are crack shots and creep right around our lines and shoot our men. Some of our chaps went into the trenches about midday. I am left for tomorrow's lot. The boys we have relieved are magnificent. No other word for it. So plucky and cheerful. This afternoon I have been busy enlarging a bit of a dugout to sleep in tonight. A sergeant and I made some stew out of bully beef and biscuits. It was a good change. It's wonderful how cheerful we all are as with the glasses we can see numbers of our poor fellows lying dead and no one can get to them to bury them. It is nearly sundown and I am going to turn in directly. Had a good sleep. We all stand to arms from 4 am until daylight. I turned in again then slept till about 8 am. Nothing doing all day but slept in my dugout but it is now 3.45pm and I am just going up in the trenches. The shriek of shells and the banging of bullets nearly deafens one at times. Have been in the trenches for about an hour. They appear pretty safe. We fire very little as there is no possible of aiming. Night time they say is worse for we have bombs etc chucked at us. With the periscope we can see out of our trenches and see the Turks rifles coming up over theirs and firing at us. It was like hell let lose in the night. From 2 am to 4 am we had rapid firing nearly all the time. I must have fired about 200 rounds. Fairly quiet during the day and we were relieved about 4 pm. Had tea and a good sleep. Sleeping nearly all day. Am just going up into the trenches again. I must admit that I wish it were all over and I could get safely away. War is not what it's cracked up to be and no one can imagine what it's like unless they have experienced it. Fairly quiet during the night but it is an awful strain on a man in the trenches especially at night when there is nothing to be seen and when for all we know the Turks are creeping on us. Nothing startling all day. Relieved at 4pm and went down to my dugout. Had a bit or tea and turned in. Had a good breakfast at about 5.30 am. Fried some bacon and potatoes and it was good! They were shelling the valley with lyddite this morning. One shell burst about 300 yards from me and a jagged piece about 6 inches long fell within 6 feet of me. The fellows are all wonderful brave though and go about as though there were no danger at all. I hate it all and admit will be jolly glad when I can get away again. Have to go up into the trenches again at 4 pm. It is as safe there as anywhere though. They have caught 3 fellows shortening the fuses in our shrapnel shells so that they have been bursting in our trenches instead of the enemy. They promptly shot the brutes. The night has been terrible. They expected the Turks to make an attack on us at about 3 am and sure enough at about 3.30 am they came at us. We repulsed them alright but lost some good lives in doing so and other good men wounded. It is not 11 am and we are still in the trenches and have had no breakfast yet. I think they are going to give us a charge at the Turk trenches soon but hope not as I reckon it is sure murder to ask men to charge in the teeth of machine guns etc. I think it and admit it its terrible to sit here in the trenches knowing any minute may be one's last. It appears to me nothing more than a death trap here and unless one gets away wounded he will be buried here. Well we had no charge, relieved about 4 pm. A lot of my mates were killed during the attack. We have moved down the valley but have to run everywhere as the snipers are deadly. In the first half hour we were down they got 2 or 3 more of our chaps. We slept in some support trenches for the night. Have been lying in my dugout all day. At about 6pm not a shot was fired and some of the men in our trenches were cheering. Upon looking up at the trenches there were dozens of Turks walking around with what appears to be Red Cross flags. They are walking about up there but we have not heard what the game is. It strikes me it is only a ruse to examine our positions as it is nearly dusk. They should have kept them down until morning. 7.30 pm and the fighting is going on as hard as ever. Shells and bullets everywhere. The shells shriek horribly as they go overhead. It appears that the spell was to get the Turks to bury their dead. We shifted up nearer the trenches in case of attack. Nothing doing all day. Have been in my dugout sleeping. It is really awful to see them bringing down the dead and as we run up the valley dodging the snipers there are often 20 or 30 dead. We have been told that when the Turks attacked us the other morning they had 32,000 men, 9000 of whom were picked men from somewhere near Constantinople. They lost terribly heavily. We have been shelling them pretty heavily today but they have kept fairly quiet. I hope it doesn't mean they will give us hell tomorrow, but suppose it will. Sent a letter home today. Slept in a support trench for the night. Got back to my dugout about 5 am. A poor chap I knew very well was struck in the head by an explosive bullet in the dugout next to mine. He was eating a biscuit. The poor chap of course has no chance of living. I am going up in a few minutes to do a bit of sapping. It rained a bit during the morning and everything is now very muddy. Quiet all night and day. I went down to the beach about a mile away and had a good wash in the sea. I guess I needed it. A mail arrived this afternoon, only papers from England though and a letter from Stevens and one from Jeanette. Hope to get the home letter tomorrow. Have to go up in the trenches sapping for 4 hours at 11.30 tonight. Did not go sapping after all so had a pretty good sleep. Armistice from 7.30 am to 4.30 pm today and everything is delightfully peaceful. Wish it could go on. Went up to the trenches and found Jerry. He has been mentioned in despatches and is now a Lieutenant. I went and had a look over the trenches and saw our men and Turks collecting and burying the dead. Some awful sights were to be witnessed and the wickedness of war is brought home very forcefully on an occasion such as this. When I went to gather up my blankets this morning I found a Turkish bullet on them. Obviously lobbed there during the night. Our chaps were exchanging coins etc with the Turks today. It has been raining at times. Hostilities were resumed about 4.30 pm but nothing much is doing and it's 8 pm. Jerry had the pudding after 4 days hard fighting and says it was grand. Of course our tucker is plain here. Bully beef, bacon, jam, vegetables and biscuits, no bread but we are doing well. Just going to turn in for the night unless called up on an alarm. We had to sleep with our equipment on but things were pretty quiet. Nothing doing all day, very quiet. Rained a bit. Stopped in the dugout and slept nearly all the time. One of our war boats, the Albion, was torpedoed a couple of miles from here. A lot of our fellows saw it but unfortunately I did not. The more I see of war the more I wish it would end. It is only murder, nothing else. On guard all night over the supply store. Fortunately it did not rain so was alright. It's a peculiar thing how one loses the horror of death when in a game like this. You pass the dead on the road almost without a thought. Had a pretty good night's sleep. Went up into the trenches at 5 am and stayed there until 9 pm. We were tunnelling under the Turk's trenches. The beggars were doing the same as we discovered by the sound of their picks, so we blew ours up today. As far as I can hear it stopped the Turks working alright. Did a bit of washing today. Otherwise spent a quiet time in my dugout. The Turks are too quiet for my liking. I heard they landed more Australians here today and had 40 odd casualties including 10 killed whilst doing so. Our aeroplane buzzes overhead pretty frequently and last night was seen to drop two bombs about 5 miles from here. We are just opposite the Island of Saros, the Gulf of Saros being a bit higher up. The Island appears to be very mountainous. Was up in the trenches again from 7 pm to 11 pm sapping. Just got to sleep when we all had to stand to arms. It was about 12.30 am. The Turks were thought to be about to make an attack. We stayed on the road in the valley until 2.30 am and they then said we could go back to our dugouts until 3.30 am. I just lay down on the road where I was and slept there. Had a fine big stone for a pillow. Sometimes I can't feel helping amused at the way I am living now compared to the old style. Had breakfast at about 7.15am and then about an hours sleep. Am up in the trenches again now in charge of a party. Will be here until about 3 pm. Saw some awful sights on the way up. The snipers are busy firing in the valley and have got several of our boys. Saw two who were just put on one side of the road to die. It's terrible and yet strange to say the awfulness of it all does not strike one as forcibly as you'd think. Most fellows grow very callous to it all and you can't blame them at all. I do myself to a certain extent and yet I can never help thinking of the mother, sister or wife far away and the poor chap there dead or dying. On the whole the Turks are very quiet again today. Have just received a mail, 2 letters from Mum and 1 from Dad and one from Art with some photos also a lot of papers. It gave me a great joy to receive them all and know that everyone was well. The Times a/c of our boys landing is good but writing cannot do them the credit they deserve. There is only a small beach here and then steep hills and valleys. The Turks fired on our boys with machine guns etc. before they had got out of the boats. Our lads threw off all their gear and simply charged the hills with fixed bayonets. They had no ammunition but charged inland about 5 miles. When one looks at the hills and valleys it's hardly believable that they even effected a landing at all. Our boys had no reinforcements so had to turn round and fight their way back with bayonet leaving hundreds of dead and dying on the way. We are now about 2 ½ miles inland right on the crest of the hills and deeply entrenched. At places the Turks are only 7 or 8 yards off. I have to go up into the trenches again for 4 hours at 2.30 am. The snipers are deadly today and got about 40 of our chaps. Was up at about 2.45am as we had to go sapping. About this time the Turks exploded a mine and then took a portion of one of our trenches. They were soon hunted out of it though and some were taken prisoners. They shelled us for 2 or 3 hours and the noise was awful. We have been standing to arms nearly all day. It is now 2.30 pm and we have just had the order to stand to arms. I don't know what for but suppose there is some dirty work ahead. In a quarter of an hour I have to go up sapping again for 4 hours. I think it will be in the trenches but am not sure yet. Was not in the trenches but in a good safe place. Turks attacked several times but were repulsed. 1.30 pm. Had a quiet time up till an hour ago when word came to get ready to move to the trenches. This entailed packing up everything. I have just finished and the Turks have now started another attack. Shells and bullets are shrieking and bursting everywhere. It's absolutely awful. Moved off about 2 pm and took our places in the trenches at about 4 pm. We have good safe trenches this time and are safer than being down in the valley. It appears that we and not the Turks attacked. The NZ's took some trenches on the left and some of our boys took some on the right. Had a pretty quiet night but it's a beggar keeping awake all the time and is a hard job. By Jove I would love a hot bath, a good feed of roast lamb, potatoes and apple pie and cream and then into a good bed for about two days: My word, how I would sleep! During the night the Turks sent up some flare lights which then lit the whole place up for a few seconds and makes you wonder what's doing. We expected them to attack during the night but they didn't. Saw a great submarine hunt from the trenches. Four destroyers were racing around all over the place. Was relieved about 4.30 pm and came down from the trenches. Had a feed and soon turned in. Had a good nights rest. Up at 3.30 am and stood to arms for about an hour. Walked away down the valley and got some water. Had breakfast about 6 and then had another sleep for a couple of hours. The weather now is pretty hot. Turks are quiet today. I have up to go up into the trenches again at 4 pm. Had a quiet night as there was nothing doing. Relieved from trenches by the 3rd Regt. at about noon and shifted into some rotten ones. Lieut. Brock was killed, shot through the head as he was taking over from us. I had only passed him a few minutes before. Nothing doing all the afternoon. Am in the support trenches tonight and expect something doing. Spent a very quiet night. It was pretty cold and had to sleep without blankets. Luckily our overcoats are fairly warm. It is not so hot today. At 4 pm we have to go onto the firing line again. These trenches are not as comfortable as others we have been in, nor as safe, but as we only have to be here a week it was not too bad. At 10 pm we started a fusillade of rapid firing on the Turk's trenches in honour of the King's birthday. That was all that broke the monotony of the night. Another quiet day. The battle ships were bombarding the Turks 6 or 7 miles from here. It was a wonderful and awful sight to see. The clouds of dirt and smoke going up where the shells landed. This continued for some hours. We had a very quiet day and nothing startling occurred. We were relieved from the fire trenches at 4 pm and spent the night in the support trenches. At 10.45 pm we had to stand to arms as the NZs were making a charge. They captured a trench and some prisoners but I believe have lost the trench again. The rifle fire was terrific as also were the bombs. The Turks throw up flare lights which light the whole place up and look very pretty. Lay down and had a sleep again about 2 am but had to get up again a little after 3. Up for an hour or so and then had another sleep. Very quiet all day. Am back in the fire trenches again for tonight. Pretty quiet night. Nothing doing all day. Received very welcome letters and papers from London at dinner time and had a good afternoon in the trenches reading them. Relieved at 4 pm and wrote a couple of letters. During the day I was observing through a periscope when a bullet went clean through it. Had a good night's sleep. Pretty hot again today. Went down for a swim in the morning. There were hundreds of chaps in when bang went a shrapnel just over our heads. There was a great scatter for the shore and shelter. Shells continued to drop about for about ½ an hour when a lot went in swimming again. I didn't! Was sitting down in a small shelter when old Shelley came along. He is well, but like me wishes it were over. Saw several cases of respirators which looks suggestive. Had a bit of a sleep in the afternoon and am now in the trenches again having come in at 4 pm. Our men attacked during the night but didn't do much good. We had to fire like hell to support them. One of our chaps (1st Regt.) was killed. Very quiet today also very hot. Relieved at 4 pm. Saw Lance Lewis and a couple of other S A boys. Had a quiet night. Relieved at about 9 am from the trenches by the 3rd Regt. Dinner time by the time I was comfortably fixed up in my new Dug-out. It's not at all a bad one and I think pretty safe. This afternoon three or four of us went down to the beach for a swim. It was pretty cold in the water but there were hundreds in. No shells were fired and got back alright. Just finished tea and will turn in for I hope a good night's sleep. Had a great night. Nothing much doing all day. Went sapping for four hours at 3.30 pm. Saw Major Barrett and Joe Brooks. Had a good night. Nothing doing all day. Went sapping again at 4 pm - good night. Spent the morning with a couple of officers of 3rd LH. Received a letter from Dad papers and a parcel with singlets etc. Going up on outpost tonight for 24 hours. Hope there is no attack. Everything was pretty quiet all night and I came down. I came down about 4 am but shells were flying about pretty thick during the morning and the boats have been bombarding all day. An aeroplane went up this afternoon and we saw 3 or 4 bombs dropped on to the Turks. Had a Communion Service this morning. It was a peculiar Service as the bullets and shells were whistling about. Had a quiet night. Nothing much doing all day. 4 pm took a party up to do some sapping for 4 hours. Shells were going fast and furious for a while. How I long for the end of the war! Not because I am afraid but I would dearly like to be safe again and able to enjoy myself in a Christian way again. Quiet night. Nothing doing all day. Shelling pretty hard during the afternoon. Must be something doing with the English about 7 miles away. Had to get up at midnight and do 4 hours trench digging. It's pretty hard work but as it has to be done no one grumbles. There was a big battle going on with the English and Turks as we could tell by the rifle fire. Nothing doing during the morning. At noon I had to take a party up to the trenches to do another 4 hours sapping. Being in charge I of course do nothing. I believe we are landing troops some miles away on both our flanks today. It ought to make a move for us before long. I suppose Greece with us in a few days now and that ought to finish off the Turks. Then our real work will begin for they are sure to send us to fight the Germans or Austrians. Everyone here would dearly like the whole war to end so they could go home. England for me if I am lucky enough to be alright when it's all over. It was marvellous the different sounds the bullets make. They are like stock whips being cracked just over your head. Some whistle, some buzz and others make a sound as of someone crying out in pain. One soon gets used to them and takes hardly any notice of them at all. All fear passes and we joke about it if one goes exceptionally close. Good quiet night. Nothing much doing all day. Had charge of a party again this afternoon. By Jove! I'm glad I'm a Corporal and not a Pte. or L Cpl as I get out of a hell of a lot of work. We have been led to expect an attack in force by the Turks any day or night now as they are being driven back a bit by the English. The aeroplane is up dropping bombs at present. Ditto Went down and had a good swim in the afternoon. Another quiet day. Pretty hot. Am applying for a com. in Kitchener's Army today. Having considered it well can see no harm in doing so. The above is all off and no one other than a Territorial is asked to apply. Went down for a swim about 6 pm. It was good. Came back to the trenches about 9.30 am. Quiet day and night in the firing line. It's a rotten job being in the trenches. Of course you can't stand upright and there's not too much room. Night time is the worst having to keep awake, though in the day time now its damnably hot. Quiet day nothing much doing. Relieved at 4 pm. Quiet night. Went for a swim at 4.30 am. Very good. Quiet all day but pretty hot and the flies rotten. Went back to the trenches at 4 pm. Received English mail – no papers. Had a bit of shooting early in the evening otherwise nothing doing. Quiet all day. Quiet night. At about 5 am just a little after being dismissed from stand to arms the Turks began to fire like blazes. We had to get our gear on and cut back to the support trenches in case they charged - they didn't but their shells were landing very close and we were getting covered with dirt and dust. They kept firing for an hour and for the rest of the day it has been quiet. Church and H.C. this morning. Slept as much as flies would permit during the day. Back in the trenches at 4 pm. Quiet night. At 1 pm some of our lads did a charge on our right which was attended with great success. About 5 or 6 miles we have been landing troops all day. Our war boats have been bombarding all day. Over the ridge of the hills where we were shelling it looked just like enormous bushfire. There was scores of boats, transports, torpedo destroyers etc. it was a magnificent sight. Relieved from trenches at 4 pm. At 8.45 pm all the fellows in our trenches started to cheer and yell and then put dummies over the parapet. Turks thought we were charging and chucked bombs etc. everywhere. Quiet here all day. Heavy fighting all last night and today where they landed about 5 or 6 miles away yesterday. In trenches at 4 pm. At 9.30 pm Turks opened up a hell of a rifle fire which lasted for an hour. After that all was pretty quiet until 1.30 am when they started again more furiously than ever and attacked us in several places. Of course we beat them off everywhere. It was the heaviest fire I have ever heard. We were relieved from trenches about 10 am and came down the valley. I slept all the afternoon. Heavy thunderstorm and rain started about 9.30 pm. I got pretty wet but managed to sleep alright. Nothing much doing today. 2 of our chaps have been sniped just a few yards down from where I am.. Went for a swim in the evening. Got back about 9.30 pm. At 10 pm I had to take charge of a burial party of 10 men. When we got to the mortuary found there was only one to bury so dismissed 6 of my men. The poor dead chap was from NZ. We had to carry him about half way to the beach dig the grave and bury him. One of his mates was there and also a Chaplain. It was a gruesome affair and we got the grave ready just as the moon rose over the hills. I could not help thinking of the poor chap's people and what they would think if they knew. Quiet day. Slept nearly all the time. Nothing doing. Had a good swim in the evening. Received mail. Another quiet day. Received another mail including tobacco, cigarettes etc.. Plenty of shelling first thing otherwise quiet all day. Spent the whole day reading the papers. Quiet day nothing much doing. Turks are putting some shells into some of our trenches fairly successfully. Another quiet day. Turks putting some rottenly big shells about. Went down and had a good swim. Quiet all day. 2 months today since we went into the trenches first. Things have changed some since then. When we first got here there were dead to be seen all over the hills and on the road up the valley there would always be several heaps of dead and the stretcher bearers going down towards the beach with the wounded. Now we don't see as many dead and dying and our casualties are not so heavy. I suppose when we begin to advance though things will be getting bad again. All the hills are covered with saps and we walk around in comparative safety now though of course bits of lead do go pretty close. Have been living on 2 meals a day lately. Too hot to bother about one at mid day. Bully beef and biscuits are not very inviting when all said and done. Wonder why they haven't published all our casualties! We have had nearly 20,000 and yet they publish them as 5,000. It's a shame for the relatives not to know. Hot and quiet nothing doing all day. Still quiet. From all accounts, things are run in a shameful way at Alexandria, Lemnos and Malta. When the wounded and sick are well, they simply please themselves whether they can come back to the front or what they do. In Alexandra, they simply wander about and have a good time, especially the officers. It's the easiest thing in the world to get back to Australia. The Navy, too, we hear in the harbours with nets around them afraid to come out on account of submarines. The American Navy men have fights with our soldiers every night in Alexandria. They jeer at fellows and say the British sank the Lusitania and blame the Germans. Very quiet all day. 7.45 p.m. and am just going down for a swim. Had a good swim. Nothing doing today. Posted a letter home, and this afternoon received a mail. Still quiet. Got a couple more letters today. Had a good swim. Artillery in going like fury and for a good while during the night. Pretty quiet all day. Turks dropping some big shells in trenches this evening. They are awful and have wounded a good number of men. Every now and then some right onto the heads there is a cry for shovels - some poor beggars buried by the dirt I suppose. We are down the bottom of the hill and can see the shells burst. I'm in charge of a burial party tonight, which is as you can imagine a rotten job. Hope there are not many to bury. Had 11 to bury - some too awful to write about took us until 3 a.m.
Reinforcements and recovered well and wounded arrived today. Went up to the trenches as supports at 9 a.m. Nothing doing all day. Had to sleep in support trenches. Nothing doing all day. Remarkably quite yesterday and today. Came into the fire trenches at 4 p.m.. They made me Acting Cpl on 10 May. After acting two months, you are supposed to have the appointment confirmed, so I went to second in command and told him I wanted my pay book altered in case I was wounded or killed. He said they were seeing into it and he would let me know. I certainly won't go back to lance corporal. Cpl is alright, they should get out of a lot of work but I'll rouse some on to the heads if they won't appoint me. Quiet night. Quiet. Relieved at 4 P.M. Had a quiet night. Still quiet. Saw Major Vernon today and asked him what they were going to do about my appointment but could get no satisfaction from him. He appeared rather cool about it. Came into fire trenches again today at 4 p.m. Quiet night. Nothing doing today. Relieved from trenches at 4 p.m. wrote a letter to dad today telling him how they block me here and including my form of com and other papers and as well as £1 for now. This letter was censored by one of our offices so they know that I am aware that they keep me back. Quiet night. Read mail. Nothing in doing all day. Came into trenches at 4 p.m. Quiet night. A relieved by second light horse and then Back in the dugout. Nothing doing. Nothing doing. We are expecting Turks to make a very big attack tonight and every preparation is being made for their reception. They may use gas so we have gas helmets. I think they will get a hell of a hiding if they do come. We stood to arms at 11:40 p.m. and again at 3 a.m. but there was nothing doing. Quiet today. Had a good swim. Every precaution against being taken for the big attack. Stood to arms at 1:30 a.m. and again at 3 a.m. but no Turks came. I think something will be doing before long there - either we must attack all the Turks will. Whichever way it goes the slaughter will be something awful. Hope I come through it safely as it will be something to remember all one's life. Quiet day today. Nothing doing at all. No attack. Went to a swim first thing in the morning. Communion at 10 a.m. Slept all afternoon. On outpost duty up the gully under the Turkish trenches. Quiet night. Still up the gully and very quiet today. Nothing doing. Had a good swim this morning at about 4:30 a.m. Bought three dozen eggs at two shillings and sixpence a dozen or so I will have a good feed or two if I have any luck. Received a mail. Nothing doing all day or night. Quiet day. Up at 4 a.m. to get enough water to be sure of a cup of tea during the day. Nothing doing all day. Had three good meals a day - boiled rice - condensed milk -eggs and rissoles made of bully beef all smashed up with onions and rolled in flour. Nothing doing. Inoculated against cholera today. Very hot day. Quiet. During the night some of our boys took some Turks trenches successfully. So far our regiment has done no charging but we expect to be in a very big attack any day now and will give the Turks hell. Nothing doing all day. Had a good swim. In trenches this afternoon. Heard young DeSaxe left here yesterday with water on the knee. He was amongst the first to land on his boat was sunk by a shell. He was drowning as he could not get his pack off but a sailor got him with a boat hook. Plenty of firing and during evening. Back in trenches at 4 p.m. Thousands of Tommies landing here every night and we are going to give the Turks a hell of an attack any day now. Quiet night. The general advance started today Our boys are, we believe, doing splendidly. We think we will charge some time tonight. I'm not afraid but of course am not looking forward to it. Everyone is happy that at last a move is to be made. We are going to get the Turks on the run and keep them going. The row is terrible. 7:30 p.m. and just had a bit of tea. Think we'll do a rough up tonight. Infantry gear served out to us all and we are ready for the ball. Charged at 4 a.m. At present I am lying on the side of the hill trying to keep under bit of cover. Bombs are terrible. Dead all around. God keep and protect me. I am not scared but it's hell. Could not hold position. Bombed out of it. I was dodging bombs all the time. Writing this as I rest on the way back. Suppose we will have another go again later on. It's hell right enough. Where I was lying on the hill there were four dead chaps beside and in front of me. No one living - bombs I think. Don't think we ran when we retreated. We damned well walked. Saw a charge on the left by the New Zealanders. They had heavy fire to contend with. Don't know how they got on. 7:30 p.m. We sent 200 and men out this morning and 157 are killed wounded or missing. We have received great praise for the way we stuck to the place. We went out at 4 a.m. and got back in about 6:30 a.m. I saw an awful charge on our left. The men seem to get about 30 or 40 yards out all right and then were bowled out over like ninepins. I don't think one of our chaps ever reached the Turks trenches. However the work is progressing satisfactorily. We have been waiting all day and in the support trenches tonight. Don't suppose there will be much sleep but as we have had very little for the last two nights and will manage all right. Had a fair sleep in the night. We were not attacked. Resting all day and there we have been forcing the Turks back on the flanks especially on the left flank. Our Regiment is now only 189 strong. I am in the trenches again tonight. We are right in the middle of the position and expect the Turks to attack us at any time. If they do it will be mighty hard to keep them back as we have so few remain in the position and most of us, especially the survivors of the charge, are very weak and feel sore and bruised all over the body where stick, stones hit us as they were chucked up by exploding bombs. The troop I am in was, when we left Egypt, 35 strong. Then we got down to 13. Reinforcements came to us a month ago and bought up to 29. Tonight we have 12 of us in the trenches. Killed, wounded, missing and sick account for the rest. Still we can now say with pride we belong to the First Light Horse Regiment as I can assure you that our boys have made a name for themselves, especially in the Turk's trenches yesterday. We were out 2 ½ hours. I badly wanted to get some snaps but hardly thought the risk worthwhile though I did think of it. Four or five of our wounded chaps are still lying out under the Turks trenches. I would volunteer to go and have a cut for them but its sheer suicide and I could no more carry a man at present than fly. I'm too sore and feel very weak. Still we are all hoping for the best where the Turks will soon give in so that we can have our hard earned rest. We have done as much if not more than any others as far as trenches go for so far we have had no spell from being under fire since we arrived. Have heard a rumour that we charge in the morning but hope it is not true as we have not the men to do any good. We had a fairly quiet night though keeping awake and alert was terribly hard work. A couple of our wounded got in during the night. We were relieved from the trenches at about 11 a.m. and came down the valley for a rest. It was needed to [sic]. It was heavenly to be able to take off my boots and lie down and have a good sleep. Later I made a good stew and felt quite a new man. Hadn't had a decent feed or my boots off for a week. Quiet restful night. Hard fighting going on all around us. So far as we can gather we are doing as well as possible. The Turks are great fighters and no mistake. They say they must have been fully 2000 of them opposed to poor little force of 200. There are not many of our old original regiment left here now and go where they will they'll never get a better crowd then the First Australian Light Horse. If I get through I';ll always be proud to say I was with them and if not your people can say for me. Three or four new officers are being appointed - not for what they have done here but because of their friends amongst the officers. Of course I am still only acting corporal. Thank God I am not of a jealous nature or my life would be a misery. Am looking forward to another good nights sleep tonight. Fellows are very amused because I took my shaving kit and paper and envelopes with me when I charged as of course I thought we were going on and I expected to get through OK. Comparatively quiet today and no news of what is going on. Had a good swim in the evening. Quiet. Very hot. Am on outpost duty today and tonight. Don't think there will be anything doing. Hope not at any rate. Am heartily tired of being here and would give anything to get away. Oh! What wouldn't I give for a good beer. Rotten post but the night passed off all right. Very hot. Relieved at 2 p.m. Nothing doing. Received some papers from home and a letter from dad of the 20th of July. Hope to goodness he does not mean there is a chance of his going to the front. Quite understand Don can't keep away long, I know he is plucky enough - too much so - but others might think he has funked it the years to come. Hope to goodness he does not come though. It would be hell having him here and not knowing how he was all the time. It's bad enough when youve only got yourself to look after. My two best pals came to grief. One died from wounds received on the 19 May and the other has his leg smashed the other day. Quiet hot day today. Went for a swim this morning very hot. Have gone in the knees and it';s a fair devil having to walk round. Still suppose they will give a man a spell some day. Hope so and hope it will be soon. Am going up to sleep in the support trenches for the night. Rotten night as far as sleep was concerned. Spent the morning with a couple of South Australian officers. Slept in support trenches at night. We made another big attack on the left this afternoon and regiment had to stand to arms for a couple of hours. There were any amount of shells flying around. Got Nell's cooker today. It's a fine little thing. Slept in support of trenches but nothing doing. Nothing doing at all today. Cannot find out how chaps got on yesterday but hope things are going all right. Our regiment - what's left of the old original - are really badly in need of a spell. We are all weak. I am just going down to church service. Was going this morning but was really too tired to bother about getting slightly respectable looking. Quite a cool night and had a fair sleep. Nothing much happening today. Was on outpost duty of from 2 p.m. onwards all night but nothing doing. Relieved from outpost at about 1 p.m. and had to go up to the trenches. 100 of our regiment are relieving that number of 2nd Regiment. Will be in trenches tonight. Received a letter from dad and mum and a paper. Went into trenches at 7 p.m. and came out again at 1 a.m. Went in again at 5.30 and came out at noon. While out of the fire trenches had to remain in the ‘supports'. Nothing happened during the night and things were very quiet. Have to sleep in support trenches until 1 a.m. Then into trenches again till 5.30 when we can get into the shelter sheds on the side of the hill until 7 p.m. Tucker is now cooked for us. Breakfast - tea and rice, dinner, tea and tea-time we get stew and tea. It saves a lot of bother A rumour is going round - it is that we are being withdrawn from here and fresh troops are coming to relieve us. It may mean we are going further round into hard fighting. If that is so it's a damn shame. On the other hand we may be going to one of the islands for a week or two to rest. The smell here is pretty bad now owing to our poor dead just down the valley and so things are not too pleasant. It has been much cooler for the last couple of days but the flies are really awful. Went back into support trenches at 7:30 p.m.. Into the firing line at 1 a.m.
Relieved from there at 5:30 a.m. and went down to the sheds. Had a quiet day and went back into trenches at 7:30 p.m. The beggars started putting a fair few shells into us but did no harm. Relieved at 1 a.m. till 530 when half of our troops went back to the firing line. I stayed in support till noon. More shells dropped into us this afternoon but no damage. We are making another attack on the left as I write this. They are firing hard so suppose things are at their thickest. Relieved and went into trenches in the usual way. Nothing doing. 52 reinforcements under Colonel Meredith came today. Nothing doing. We had been reinforced by A squadron of the 12th light horse. Came down from trenches. Resting all day as for the last couple of days I have been very caught feverish etc and off-duty. Lying down all day. Nothing doing. Doctor told me at 4 p.m. I had better have a trip away. As there are only about 40 of the old regiment left in Gallipoli and half of them had been away at one time or another I raised no objection. Four months is a good spell and I reckon I deserve a change. A fellow carried my bag down to the beach hospital where I waited until 8:30 p.m. About 20 of us were then put into a barge and towed out to a hospital ship. The Gloucester Castle, one of the South and East African mail boats and a real beauty. They gave me a mattress on deck and I soon dozed off. We set sail about 2 a.m. Arrived at Lemnos at about 8 a.m. but as they are full up there and we have 800 odd poor beggars aboard here they can't take us in. At about 4 p.m. we weighed anchor and set off again and are I believe going to Alexandria. A week or two away from everything will do me the world of good. I had the first bit of tucker today that I've had for five days. Bread and butter breakfast and tea and some spuds and gravy for dinner. If I had been in the trenches I suppose I would still have been fasting as of course there is nothing one can fancy and its damned nuisance cooking anything. They look after you very well on board. I have had visits from two doctors and numerous orderlies and everything is beautifully clean. There are some nurses aboard but they only attend to the serious cases. It's very nice seeing a pretty gal again. Well I'm going to lie down again and enjoy a complete rest for the next 48 hours at sea. Been sleeping all night and pretty well all day. First uninterrupted nights rest I'd had for months as we always had to get up at 3 a.m. or a little after when we were out of the trenches and stand to arms. Getting hotter now. The nights were always cold in Gallipoli but I suppose we'll have hot ones now. We have had about a dozen deaths aboard. The worst of it is that perhaps a poor wounded beggar is on board the boat over a week as they have to fill the ship. Got to Alexandria at 4:30 p.m. Numerous hospital boats here and some with a few troops aboard. We are to go to Cairo I believe. Had a good hot bath yesterday and cold shower today. Stayed on board all night. Disembarked at about 8:30 a.m.. Had a good trip to Cairo, having with my usual luck secured a bunk and was very comfortable. We got to Cairo at about 2 p.m. and were taken to the Palace Hospital at Heliopolis. We were then drafted out. I am in No 3 Auxiliary. We have a big wooden sheds 50 beds in each and everything very nice and clean. They took all our clothes and gave us pyjamas. Everyone walks about in them, having nothing else. For the first time in over four months I am going to have a sleep without my clothes. Mrs Shore and niece came and bought some cake and books. Received a parcel from Nell with cake, soap and cigs. Borrowed some togs from a patient in the afternoon and went down to our old camp. Asked for and received £2. Saw some of the old boys. In the evening went in to Cairo and had tea with the Shores. They were very kind as usual. Received some togs today as have to go to a convalescent camp at Helouan. Got dressed and went down to another hospital to see Tom Fitch. He is pretty crook and thinks they will send him back to Australia. Stayed there about half an hour and then met a pal and went in to Cairo where we spent a pleasant evening. Went to the Kursal, a kind of Tivoli Theatre which was good. About 50 of us were taken to a railway station in Cairo on Red Cross motors and entrained for Helouan. We are now at one the millionaire hotels called Hotel Al Hayat. The tucker here is better and more plentiful than at the last place and we are in a nice cool building and can of course go out on balconies etc. Leave for Helouan is granted every day as everyone here is pretty well. I'll go down in a day or two. A rough picture show held here tonight. Church service in the morning. Got leave and went down the town in the afternoon. After wandering around for a bit went to a pub and while sitting in a room an Englishman and English girl came in. She went out and he spoke to me. When she came back he asked me my name and introduced me to her. Then they asked me to have afternoon tea with them. I did so. They were very decent and said they would send me some magazines. They had to catch a train for Cairo soon after tea but as I had leave until 9 p.m. I stayed at the pub for dinner and had a real good feed. Things are pretty deadly up at the hospital - nothing to do and too much time to do it in. Received letters. So it's true Don has joined. Tom Fitch told us he had. Hope he gets a Com as it's much nicer when all things are considered especially when you are away from the front as you can then live like a gentleman. Really could not stand this place any longer so almost had to beg the doctor to let me out. He said he would. It's like being herded with a lot of wild beasts living with this mob. They are the best fellows in the world to fight with but to live with - Gosh it's terrible. Besides that the place is full of bugs. Left Al Hayat at 9 a.m. and caught the train to Cairo. Then we caught another train to a place called Helucien [?]. Ite is about 1 mile or perhaps two from Heliopolis. After dinner I cleared out to the old camp and saw some of the old boys. Stayed to tea with them and then wandered back to this camp. We have to fall in at 6 a.m. and then are dismissed after about half an hour. Nothing to do all day and you can clear out or stop in camp. Compulsory church parade at 7 a.m. this morning. After dinner I went down to see Tom Fitch. He is still in bed. Spent the afternoon with him and then went across to the hospital I used to be in and saw some of the fellows there. Cleared out just after breakfast today and went down to the old camp. Stayed there all day and then went up to my old hospital for tea. After that I took a run in to Cairo and wandered round her for an hour or so but soon got tired and came home. We hear that some of our boats have already got through that Narrows also that Kitchener has been to the Dardanelles. I bet he'll shake the possum in Ian Hamilton and some of the blundering heads. Feeling off the last few days so went to a private doctor. He reckons I have a touch of malaria. Doctor passed me fit for active service. Went back to the old camp but the doctor there immediately took me off duty. Sent back to Hospital No. 2 Auxiliary. Met Mrs Norris who said she would have me transferred to ‘Gezira'. Came to Gezira. Room to myself and every thing I want as in a private hospital. Dr and Mrs N come up every day and bring fags chocolate etc. Got up for an hour today. Very glad to get back to bed then. Drove out with Dr N to where his wife is a room and had afternoon tea. My doctor says today that I'll soon be able to get away from here so that ends all hope of a trip to England this time. Still better luck next time. Was sitting on balcony at my window when I heard my name spoken and someone say 'Yes, that is a man I want'. A sister called me in and a stout grey haired old chap with a white moustache led me into another room. He told me to sit down and he sat down himself. Told me he was Colonel Ryan. He said I had put in a complaint about my hospital treatment. I told him he must be mistaken. Then he produced a letter and said the High Commissioner desired that arrangements should be made to send me to England. He told me that an order had recently come out to the effect that no more Australians were to be sent to England on account of the climate. However he said he would do what he could for me and try and get me there for five or six weeks. He asked me how I would like to go up to Luxor but I told him that never having been there, I of course, could not tell whether I would like it or not. He then mentioned Helouan but I told him no I wouldn't go back there if I could possibly avoid it. I had come to the conclusion by now that he had some object in offering me these trips and sure enough the next he said was 'Well how about a trip to Australia'. I thanked him but told him with was not anxious to go there but desired to go to England to see my people. Soon after this he left promising me he would do what he could for me. During the day I had a p.c. from Professor Watson saying he would see what he could do and it was no harm to put the matter before the authorities. From all this it looks as if I have a hope of getting to England after all. Professor Watson called to see me. He said he understood from dad's letter I had been passed to go to Australia. He said he would seek Colonel Ryan and do his best to get me to England. Another fellow and I took a couple of the sisters for a drive this afternoon. We went out to the zoo, had afternoon tea there and altogether had an enjoyable time. On the way home caught sight of old Shelley in one of the camps so of course went across to see him. He has been ill but is all right again. This morning telephone rang and I was told I had to go to the board room. I went down and my medical papers were examined. Dr N was on the board and it ended by them strongly recommending me to go to England in preference to Australia. Dr N told me afterwards that they would do all they could for me but explained that of course they could not fix it up themselves as it would have to go through two or three more hands yet. Still I think I have a very good chance of a trip somewhere or other now and am once more hoping it will come off. Mrs Norris came up in the afternoon and spent about an hour with me. The Shores visited me also Prof. Watson and one of the old Bank boys who now has a commission. Went for drive to zoo again. Went into Cairo to try and find out what is going to happen to me re my trip but was told it was not yet fixed up and that I would be advised in a few days. I'd give anything I possess for them to say Yes and do so hope that they will. Went into Cairo in afternoon. Two sisters and five of us fellows hired a boat at about 6 p.m. and got a couple of Niggers to row us up the Nile for a couple of miles. We then landed and had some tucker which the sisters bought with them. It was a beautiful night and we had a pleasant time, arriving back in hospital at about nine o'clock. Xmas day. The hospital is all decorated and looks very pretty. The sisters have been working hard to ensure everyone having a good time. I went to church in the morning. At dinner the tables are all decorated and there was plum pudding. High tea was provided by the Red Cross people and everything passed off very well. I had a very good time, all things being considered and remembering it was in hospital. A pal and I went into Cairo as I felt I wanted to have a decent dinner. We went in about 5.30 p.m. and got back shortly after nine. My trip was refused at this evening. All the heads came out and I was examined and though I am pretty sure they knew what they were going to do before ever I was examined. I am to go back to my unit. Went into Cairo and got some money in the afternoon and then went for a drive around for a bit with another chap. Expect to get my discharge from hospital today. I gave them a hand in the office today for something to do. Received some letters from home. Spent the evening yarning with some of the sisters. Am going to watch night service at 11.15 p.m. tonight. Tomorrow I'm going back to camp. In a way I'll be glad to get into harness again but of course will be sorry to have to leave a good home such as this for the dirty old desert.